May 2018: On Heaven’s Doorstep: God’s help in Times of Crisis-True Stories from a First Responder, the sequel to At Heaven’s Edge, has been released by Harvest House Publishers. Medical emergencies are among life’s most unexpected and terrifying realities. But isn’t it reassuring in times of extreme crisis, you can find hope and comfort in the hands of a loving God? As you read these firsthand accounts of perilous situations with uncertain outcomes, you will experience a full spectrum of emotions, from tender heartache to tremendous joy. Through it all, you will witness God’s amazing love and care for His children, both for those who are brought back from the edge and for those He chooses to call into eternal fellowship with Him. “Rodgers, a veteran volunteer EMT and physical therapist for a trauma center, provides an up-close look at medical emergencies she has encountered over the years. This book contains 30 true stories featuring people of all ages, with different issues and outcomes. As an example, Rodgers tells about responding to a call where a man’s arm was stuck in a garbage disposal. His hand was beginning to swell, and nothing seemed to loosen it. He had heart problems, and his blood pressure was rising. What would the EMT crew do to quickly and safely rescue him? Other stories involve extreme alcohol poisoning, bicycle and automobile accidents. and various health issues. Rodgers consistently shows God’s hand at work, and readers will feel various emotions as they digest each situation. 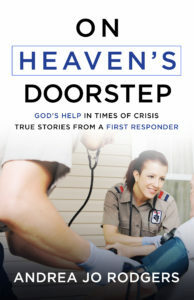 On Heaven’s Doorstep: God’s help in Times of Crisis-True Stories from a First Responder is available at many Choice Books locations nationwide as well as numerous online booksellers.